Let me begin by saying I LOVE me some Nutella. It is just a beautiful thing. Take one perusal of this blog and you will see it is true. I enjoy baking with it as a way to reduce the ingredient list and whip together an indulgent treat. I wanted to try my hand at making a simpler hazelnut spread with some of my favorite ingredients. This was the end result and all 7 of my kids LOVED it!!!!! I still enjoy baking with Nutella. This is now my go to hazelnut spread from now on. 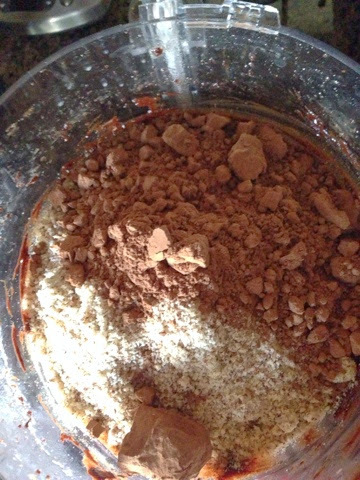 Place first 4 ingredients into food processor and process till combined and somewhat smooth. While processor is running drizzle in 2 cups of Almond milk, continue to process until well combined and smooth. 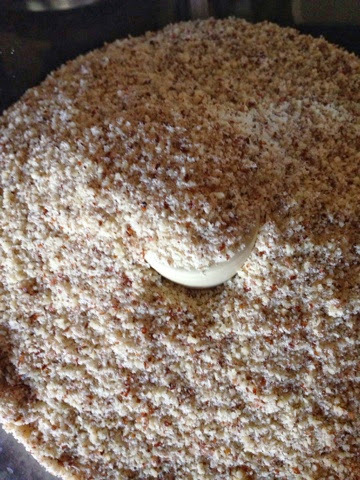 Depending on the consistency you are looking for you can add more Almond milk, until the consistency you desire is reached. Store in containers with air tight lids. Keep refrigerated for 1-2 weeks. I am in love with this recipe. Pinned to make this weekend. My youngest loves Nutella – and I don’t let her have it because of the sugar. Yiou are now her official – favorite person. Thank you thank you thank you!! You had me at Nutella! These sound ah-mazing!! Can you believe I’ve never tasted Nutella? I will have to give this a try, nice work! Sounds delicious! And so simple to make!!! So great to have an option to Nutella. We’re trying to cut out some of the sugar, and this sounds yummy. Shann, same here. We still use Nutella occasionally, however, I prefer this recipe. Thanks for stopping by. I hope you like it. Thank you for stopping in and commenting. I recently, like two weeks ago, tried Nutella for the first time and yes, it was very sweet. I bought it for my granddaughter and realised that it was a mistake as we are trying to keep her away from too much sweets. Will pass on this recipe as an option. Claudette, Nutella does have a load of sugar in it. I do like to bake with it occasionally. 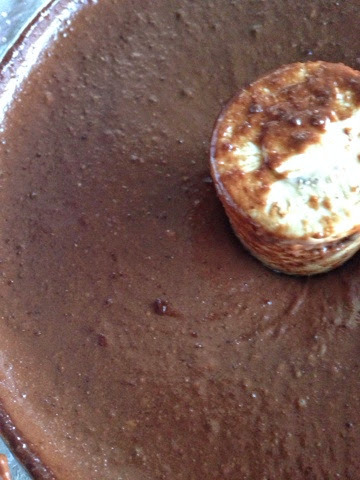 It allows me to make a quick dessert with just the Nutella, eggs and a few add-ins. I see Nutella as a ready to go cake box, it has the majority of what I need in one container. My boys get giddy when I bring it out because they know something special is about to go down when I bring out my version or the original . Oh my gosh, you’ve gone and done it now. I’ll never stop making this! It looks so good! Liz, you get the award today for making me laugh out loud. Thank you for your comment. I never would have thought to attempt to make this at home. I want to try it now. Rika, I get it through Amazon. I want to say it comes in a 4 pack. Thank you Victoria. Come back and let me know how you all like it. Gotta make this Nutella for my dad. He’s cutting back on his sugar intake because his blood sugar level is nearing the boundary. I hope he likes it. You are so awesome for making it for him. Way cool! I love making my own spreads at home and this is definitely something I’d like to try! Elizabeth, I hope you like it. Thanks for commenting. Oh wow, this looks amazing! I think I’m going to have to try making my own nutella. 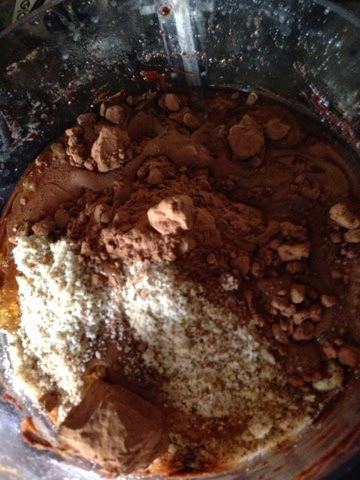 Stephanie, I hope you do, it is really easy and has all the rich taste of hazelnut and cocoa. We love Nutella! Thank you for a healthier recipe. I saved it on Pinterest to make in the future. No way! I’m totally making my own. I’m a whole-foodie, so I don’t eat Nutella but had it years ago. Loved it then and can’t wait to try this! Yay, Ashley, it is amazing stuff. I hope you like it. That sounds like an awesome spread recipe. We love Nutella around here also. My brother has made this a few times. It’s so tasty, I love it! I also like that you can keep track of what is in it. Oh a healthier version of Nutella, what’s not to love? Yum! I never though of making my own hazelnut spread. Great idea. Never knew there was such a thing as hazelnut flour. Thanks for sharing this recipe. Huub Ricardo recently posted…How to clean a vintage piece with kitchen essentials. No problem Huub. I get mine through Amazon.